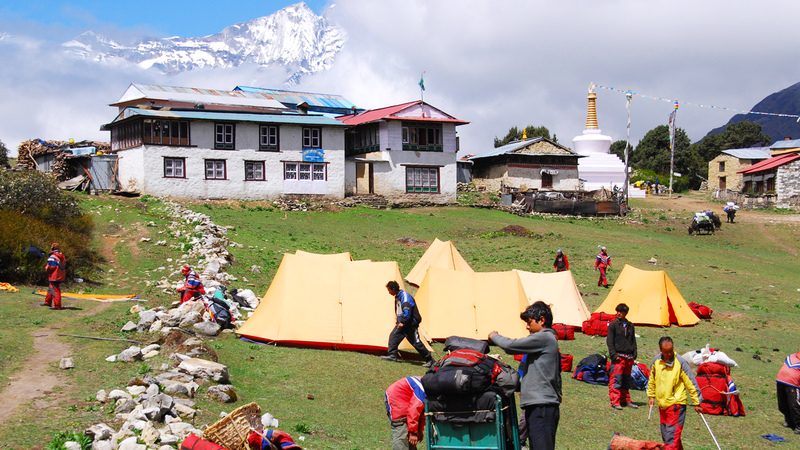 The classic trek to the Kalapatthar and Everest Base Camp from Lukla is about two weeks which is located in the eastern part of Nepal; the Everest region offers a wide range of trekking experiences which is the abode of highest peak in the world. 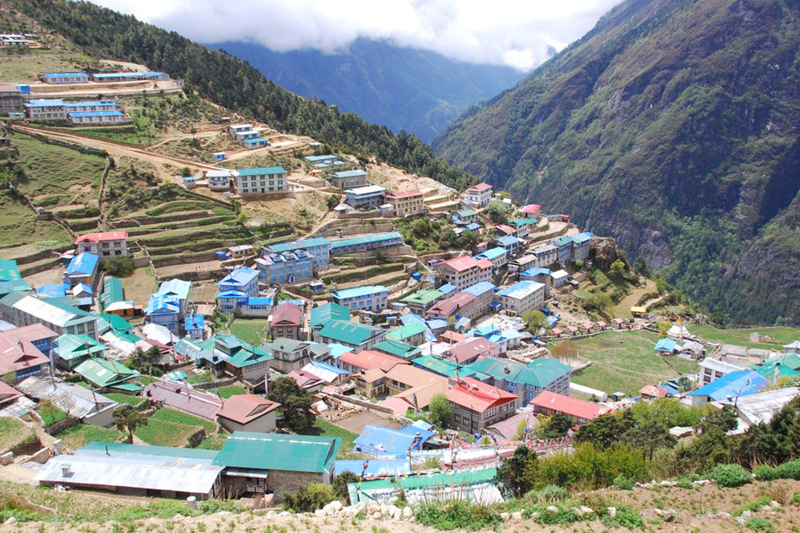 This trek not only comprises Everest Base Camp but also Namche Bazar, Tengboche, and the whole of Solukhumbu district, which are at the lap of Mt. Everest (8848m) and Amadablam. This trekking is well known for spectacular mountain sceneries however it is also famous for Sherpa cultures and life style. Visitors can enjoy and learn this culture very closely after visiting this region. The complete trek starts from Jiri to Lukla and ends at the same place with 28 days, however, the best option for those who have very limited time can fly to Lukla and back within 12-16 days.Gokyo lake, Kalapatthar, Everest Base Camp, Syangboche, Renjola pass etc. are the major spots of this region. The trial climbs up the Dudh Koshi Canyon, crossing from side to side passing the villages of Benkar and Chomou and through forests of blue pine, fir and juniper. Between 3600m and 4200m birch and rhododendron predominate. Solid villages with dry stone walls of the type and the lake district can be seen running down from the high meadows. After registering the name of tourist at Jorsale, the trial undulates along the valley up to the confluence of Bhotekoshi and Dudh Koshi. This part of the trial is virtually sunless and notoriously cold and windy, the wind funneling down the gorges of both rivers. From this point, you begin the final step to Namche Bazaar. Along the trial, you can explore the Mt. Everest, Mt. Nuptse and Mt. Lhotse etc. Overnight rest at Namche bazaar. A rest day for acclimatization, which is situated in a sheltered horseshoe shaped basin high above the Bhote Koshi Gorge.Terraced houses cling to the hillside.It is as developed town where banking facilities also available. From Namche, it is a steep one hour climb to Shyangboche ( 3720m). There are good views of Amadablam and Everest from here, and a short airfield built to serve the superb view at Everest view hotel. 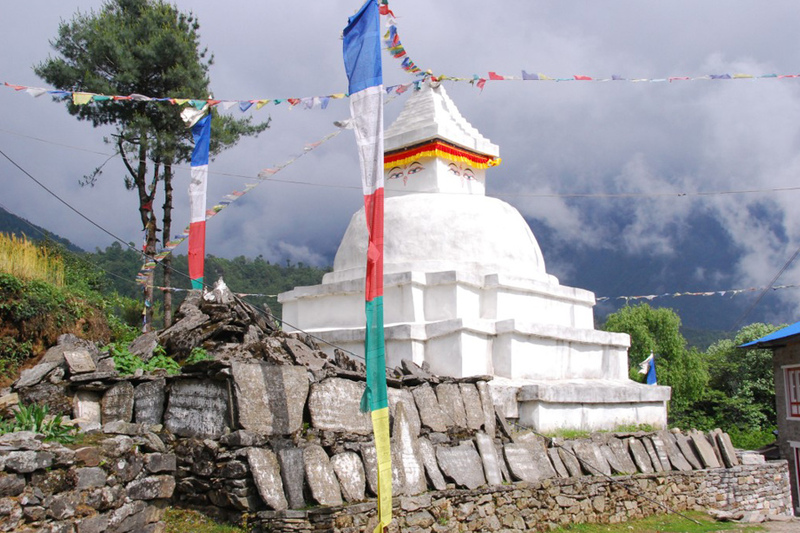 The trial descends from the this point to the village of Khumjung(3790m). The gompa claims to possess the skull of a yeti, though tests have shown it to be that of humble serow (a goat like antelope). The mixed forest of rhododendron, birch and silver fir contrasts with the bar slopes of the gorge and you may see musk deer and impeyan pheasant. The trial from Khumjung goes down the valley, past chortens and mani walls and soon meet the trial from Namche to Tengboche then climb steeply at first through forest then more gradually to the Tengboche. At early in the morning, a magnificient view of Kwangde (6187m), Tawache (6542m), Everest (8848m), Nuptse (7835m), Lhotse (8616m), Amadablam (6856m), Kangtega ( 6779m) and Thamserku (6608m) can be arrayed in a stunning panorama. Mani Rimdu festival held in full moon day of November/December. Descend through forest to Devuche where there are a few travellers’ lodges & nunnery. 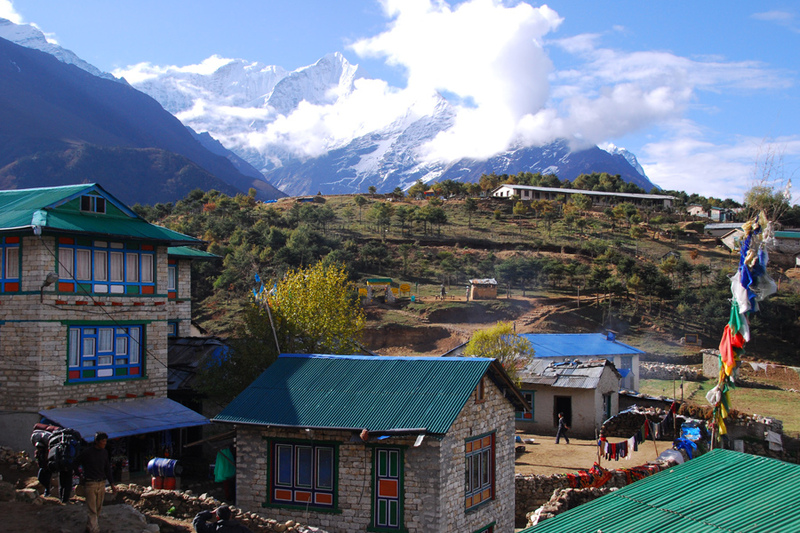 After crossing the Imja Khola on a steel suspension bridge, climb up past some mani stones to pangboche (3860m), the highest all year settlement in the valley with the HRA first aid post and some lodges. The gomba claims to have a yeti scalp and hand, which yopu can view for a small fee. 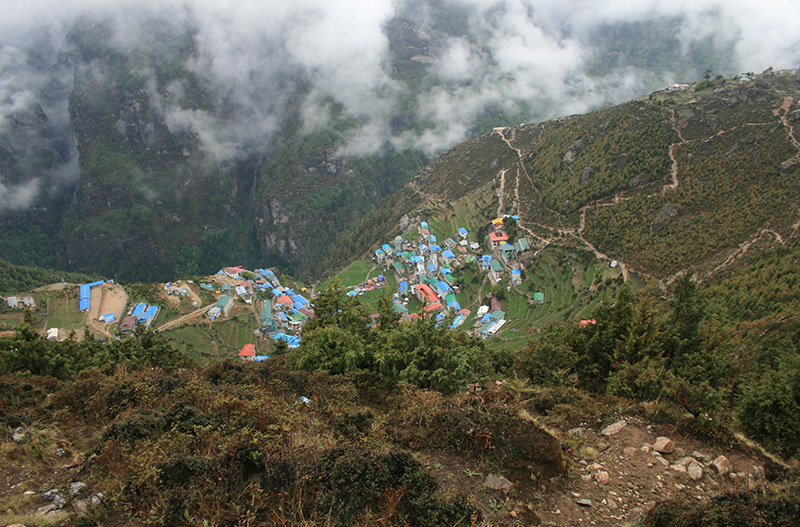 The trial passes through the small villages of Sherpa community. A side trip can be made up to Nagkartshang Gompa (4600m) which also offers a good view of Makalu. 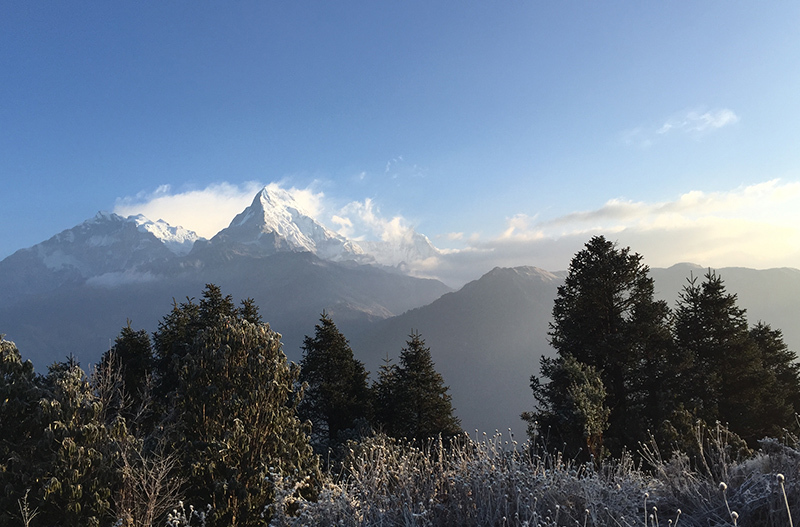 There is another, more strenuous, side trip to Chhukung (4700m), a small summer settlement where you can get excellent views of Island peak, Lhotse & Amadablam. The first part of the route passes up the long scrubby flat bottom of the valley to Phulung Kharka. It rises steadily, then drops down, crosses the river and enters Dughla (4620m) with its tea shops. From here the trial climbs higher and onto the moraine. A row of chortens in memory of the Sherpas who have died on Everest marks the top of the climb. The views of Tawache & Nuptse are spectacular from Lobuche. Khumbu Glacier morain until the terminal morain of the Changri Nup and Changri Shar glaciers on your left. It then becomes steeper and rougher as you climb to the top of the morain. As it crosses an unconsolidated slope, the path changes from season to season. Usually, there are small stone cairns and tell tale signs of Yak droppings to indicate the way. Then a short descend to a dry sandy area of Gorak Shep which has a small lake beyond. Mt. Pumori (7161m) can easily be seen from this point. As you follow the south ridge down, you can see Kalapatthar(5545m), the common point for viewing Everest. 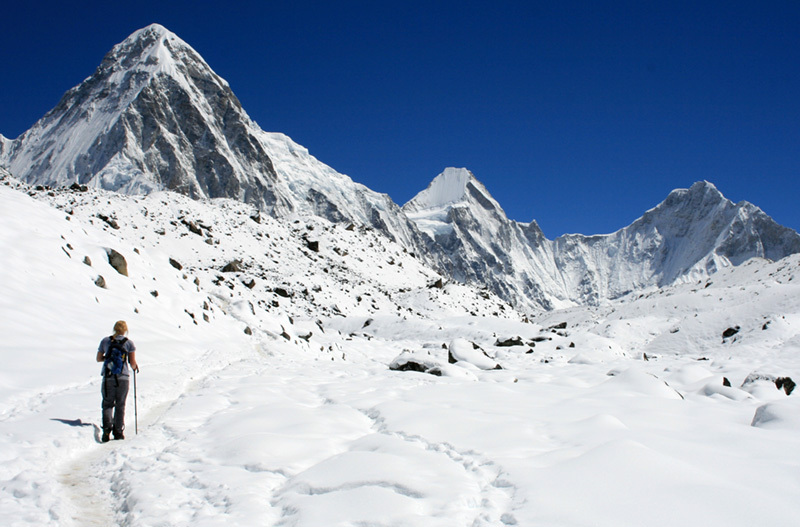 Gorakshep – EBC is the east of Khumbu Glaciers. After Gorak Shep, you head out through boulder strewn area, some of the rocks having inscription to the many climbers and Sherpas who have died in pursuit of the summit. 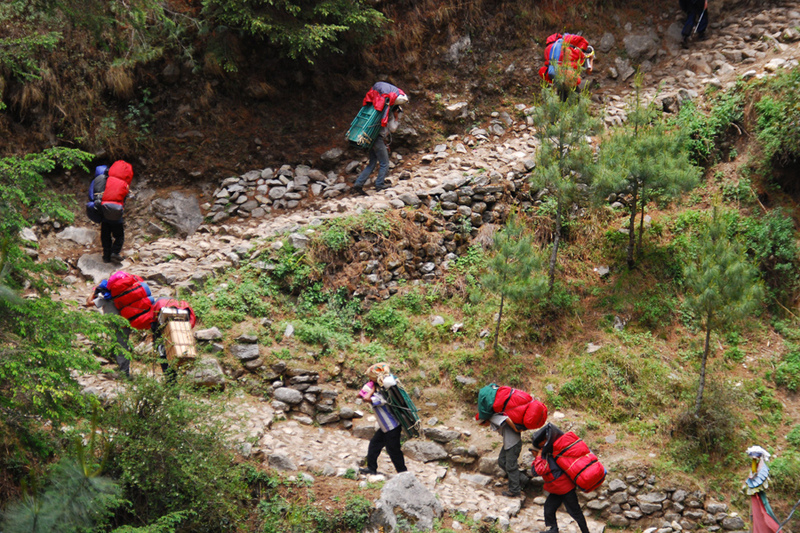 The trial then crosses the morain wall and descends to the Khumbu Glaciers which you cross. Cairns mark the route which changes the path frequently. A great care is required. The round trip from Gorak Shep-EBC-Gorak Shep requires 6 hours. The trek decends down to Pheriche, lunch and finally the walk ends at Pangboche (3860m), the place is at the bank of Imja Khola. Today, the trial descends down and stopping at Tengboche. The full moon day in November-December, the colour full festival called Mani Rimdu falls with singing and dancing. Overnight at Namche. The trial from Namche steeply descends to the Hillary Suspension Bridge and then continues on an easy regular trial. Overnight at Lukla.